The competition may be stiff, with Honor, Motorola and Lenovo already pushing out impressive, low-priced alternatives, but at its price, 2017's Samsung Galaxy A3 comes highly recommended. The Galaxy A3 (2017) remains a very solid and respectable mid-range smartphone with little cause for complaint. The battery life improvements are more important: due to its incredible power efficiency the Galaxy A3 (2017) is an extremely durable beast. Both cameras have been improved as well, and the latest reiteration fares much better under low-light conditions. By offering a waterproof smartphone with fingerprint sensor, a very elegant design and a SIM + microSD for a competitive price, it's definitely going to attract a lot of positive attention. The Galaxy A3 (2017) is such an exciting phone: it brings a level of sophistication in design and interface that we have not yet seen on affordable phones. Neither have we seen a phone with water resistance.... At the end of the day, all things considered, the Galaxy A3 (2017) is a winner with a lot of great things going for it. Samsung has created another solid mid-range smartphone contender, and this one looks and feels more like its high-end brothers than ever. 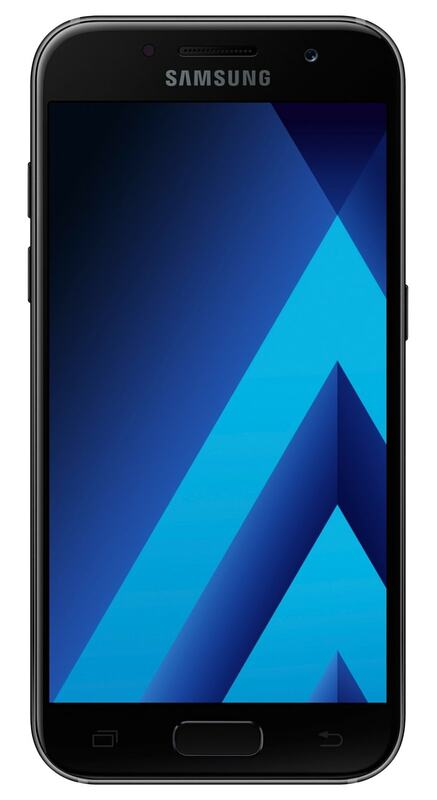 Every day, we search through thousands of tariffs and offers from UK online retailers to find the best Samsung Galaxy A3 (2017) deals and contracts across a selection of price points and needs. Select 'Pay Monthly' if you're looking to get the Samsung Galaxy A3 (2017) as part of a monthly contract with minutes, data and texts. Alternatively, choose 'No Contract' if you prefer to buy the Samsung Galaxy A3 (2017) SIM Free or on Pay as You Go. Finding the perfect deal is easy. Just use the sliders to filter tariffs for minutes, data, monthly cost and upfront cost. You can also filter by network and retailer to find the best Samsung Galaxy A3 (2017) deal for you! The cheapest contract price in this category is cheaper than buying the Samsung Galaxy A3 (2017) SIM Free and a comparable SIM Only tariff by . You could save on the cheapest contract price in this category by buying the Samsung Galaxy A3 (2017) SIM Free and a comparable SIM Only tariff separately.